You can’t use a pressure washer without a hose. Here, I’ve listed 6 best pressure washer hose options that are known for their quality. Check them out now! So, you bought a brand new high PSI pressure washer and decided to just use your old garden hose as an attachment rather than buying a new best pressure washer hose. Thinking you’re all set to work, you started the pressure washer but found out that the water coming out of the hose is only about 50 PSI. Oh no! The pressure was just too low to clean your driveway and patio. So, you blamed the brand new pressure washer you just bought; and claimed you’ve just been scammed. This is quite a common scenario among newbies or first-timers who don’t know that much how a pressure washer works. The problem here is not the pressure washer; it is the mismatch of high PSI pressure washer and the average garden hose that is usually suitable for low-pressure watering. For cleaning tasks at home, using a small size diameter pressure washer hose is the most suitable. Professionals understand that the best pressure washer hose plays a significant role so that the pressure washer can operate at its best. That is why, in this article, I’ve compiled the 6 best pressure washer options in the market recently so that you’ll have an informed buying decision. Want To Know My Top Choice? 1. What’s The Best Size For The High-Pressure Hose? 2. What’s The Difference Between The Pressure Washer Hose Vs. Garden Hose? 3. Can I Replace The Nozzle To Increase The Pressure Of My Garden Hose? 4. Is It Safe To Use Pressure Washer Hose For Hot Water Pressure Washing? Just like any other pressure washer accessories and attachments, you need to know the important factors to consider when buying the best pressure washer hose for your pressure washer machine. You either get a long or short hose as long as it can reach the areas you intend to clean. Most professionals recommend getting both 50-feet and 100-feet hose. Anything longer might cause accidents such as tripping over a twisted hose. The three common pressure washer hose materials are PVC, Polyurethane, and Rubber. The PVC is the cheapest choice, but seasoned pressure washer users don’t recommend this one as it is not flexible and can easily get tangled. If your budget allows it, choose either the Polyurethane or the rubber hose. The rubber material is great for long hoses as it is more flexible and kink-free. The Polyurethane, on the other hand, is most professionals’ choice because it is flexible and durable. Unlike the rubber, this one doesn’t mar easily. Aside from the length and material, you need to consider the diameter of the hose as well. You can choose from three common size choices, namely small (¼ inches diameter), medium (5/16 inches diameter), and large (⅜ inches diameter). For pressure washers with less than 2700 PSI, use a pressure washer hose with small size diameter. Use the medium size for pressure washers with 2700 PSI to 3400 PSI. Lastly, the large size diameter hose is ideal for high PSI pressure washers, especially those pressure washers used in a commercial-grade level. You might argue that connections are not important, but I’ll tell you that connections are a must if you want your pressure washing experience to be hassle-free. 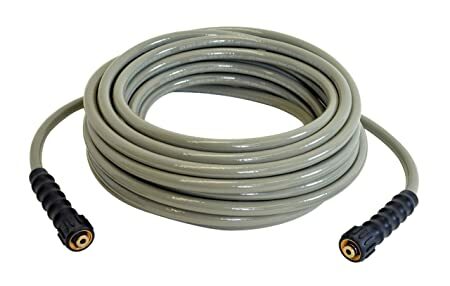 Usually, pressure washer hoses have two connections; one is connected to the pump whilst the other one is connected to the spray gun or wand. Hose connections are usually made of steel, brass, or plastic. The most important thing is that the connections of your hose fit the connections of the pump and the spray gun. When connecting with the pump, you can either snap or twist them together. However, when connecting with the spray gun, you need to check the thread. For instance, if the gun has the male thread, then it is possible to connect it with ordinary pressure washer hoses with an M22 threaded connector. Schieffer Co. is one of the most trusted and popular company that design, develop, and sell pressure hose solutions. Thus, it is no wonder why a lot of pressure washer hose reviews include products from this brand. With a 50-feet length and 3000 maximum working pressure under its belt, this Schieffer Co. 646200098 Pressure Washer Hose is great for medium-duty cleaning. It doesn’t work with some quick-connect fittings. Works best for consumer use only. Simpson is yet another reliable pressure washer hose brand in the market. With the universal M22 fittings that have a dual O-ring design, you can connect this hose to both 14mm and 15mm connections. This is also 50-feet long, a perfect length for driveway and patio cleaning. The Simpson Cleaning 40226 Pressure Washer Hose is also light and easy to use. Some users reported that bubbles started to form on the hose after 1 year. I cannot think of other cheapest and most versatile pressure washer hose in the market other than Sun Joe. Sun Joe is undeniably one of the most budget-friendly brands there is. 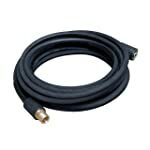 This Sun Joe SPX-25HD Pressure Washer Hose is an extension hose that is suitable for quick pressure washer cleaning. 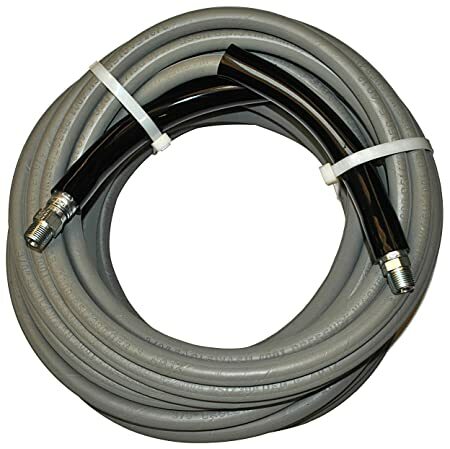 The hose is 25-feet long, which you can easily connect to your existing pressure washer hose, whether it is also a Sun Joe pressure washer or that from another brand. You can use this hose to any pressure washers with 2900 PSI and below. If you have any Sun Joe SPX series, then you can use this pressure washer hose without problems. The hose is resistant to abrasion and any severe weather. This does not fit the Sun Joe SPX1500 series. Introducing another best pressure washer hose by Simpson Cleaning, the Simpson Cleaning 41030. If you want a medium-duty pressure washer hose that has a reliable quality, then look no further than Simpson Cleaning. This hose is by far the longest on the list with a total length of 100 feet. It also has the highest working pressure with 4500 PSI. You can reach more areas with this hose as it is 100-feet long. This can be used as a replacement hose or an extension hose. The best pressure washer hose for porch walls and backyards. It's a bit difficult to wind up this hose. So if you want one that you can store quickly, this is not the right hose for you. Since it has the longest length, this one may cause inconvenience and accidents. Still, it’s a good hose for outdoor cleaning. I am not at all familiar with the JGB Enterprises; hence, I am a bit hesitant whether this brand is a good one to recommend. But a quick search on the web is what it takes to change my mind. JGB Enterprises is a hose assembler of hydraulic and industrial hoses. They assemble any type of hose for all applications. In fact, this JGB Enterprise Eagle Wash Pressure Washer Hose can handle high-temperature pressure washing, a perfect fit for commercial use. Quality wise, this one is a strong contender. This is the best pressure washer hose for hot water pressure washing. It can handle very high temperature as high as 154 degrees Celsius. 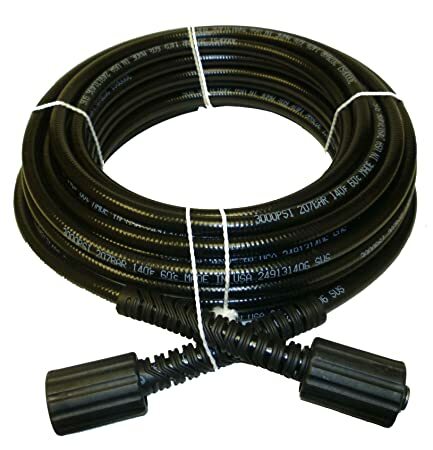 JGB Enterprise Eagle Wash Pressure Washer Hose features a Nitrile tubing, a professional-grade tube that can withstand a huge range of conditions, specifically in industrial applications. Briggs & Stratton is another popular brand of outdoor power products including pressure washers and pressure washer hoses. 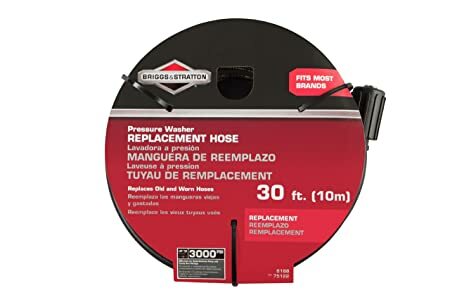 This hose by Briggs & Stratton is 30-feet in length but is also available in other lengths should you want a shorter or longer hose. However, please note that Briggs Stratton 6188 hose is best used as a replacement hose for worn and damaged hoses. This can handle cold water pressure washing only and is ideal to use with electric pressure washers. You can choose from three different length options: 25 feet, 30 feet, and 50 feet. The rubber coating though is not durable. Checking the 4 considerations when buying a pressure washer hose, I think that Schieffer Co. 646200098 Pressure Washer Hose is able to meet most, if not all, of the factors. Firstly, the 50-feet length is enough for most cleaning tasks at home. You can already reach a lot of areas with this length. Secondly, Schieffer Co. wrapped all their pressure washer hoses with high tensile wire braided rubber, plus high-quality couplers. So, if durability is one characteristic you look for in a pressure washer hose, then you can get it with this Schieffer Co. 646200098 Pressure Washer Hose. Lastly, this has a 1/4-inches diameter, perfect for medium-duty cleaning that a semi-professional owner like me would love to use. As mentioned in the buying guide above, you need to consider the length and the diameter of the hose. The longer the hose, the more areas you can reach and clean whilst the bigger the hose diameter is, the more it can withstand high water pressure. Professionals usually use a hose between 50 feet to 100 feet, depending on the task at hand. As for the diameter, it depends on the maximum working pressure it can handle and the PSI level of your pressure washer machine. Use the small size diameter for light to medium-duty cleaning with working pressure of 2700 PSI and below. Use the medium size diameter hose for 2700 PSI to 3400 PSI, and the large size diameter for a higher pressure or PSI level. A garden hose is not suitable for high-temperature and high PSI level pressure washing that a pressure washer hose can easily handle. The main difference between a pressure washer hose and garden hose is the acceptable pressure it can produce and handle. The average garden hose does not produce enough pressure to clean stubborn dirt and stains that a pressure washer hose can easily do. Furthermore, the best pressure washer hose can help you save more water as it can get rid of dirt, debris, and stains quickly and efficiently. Hence, you can also save money on electric bills. You see, the pressure washer hose has a higher PSI than a garden hose. So, even if you use it with a high PSI pressure washer machine, you are confident that it can withstand the pressure and will not get damaged easily. So, should you buy a pressure washer hose for pressure washing? Absolutely! While nozzle attachments can help us control the volume of water coming out of the hose, they do not add to the total PSI level of the machine. If you are using a pressure washer machine with a maximum pressure of 3000 PSI, then expect that this is the maximum pressure that the hose can produce as well. Pressure washer nozzles only let you adjust and manage the flow and angle of the water coming out of the hose. The top 5 nozzle attachments are zero-degree, 15-degree, 25-degree, 40-degree, and 65-degree also known as the soap nozzle. These nozzles allow you to adjust the angle of the water depending on the cleaning task you intend to do. Definitely! In fact, experts suggest you stick to pressure washer hose when doing high-temperature pressure washing. 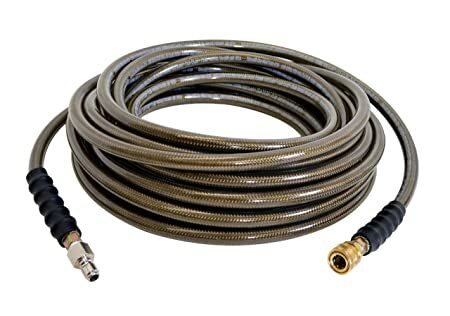 Some specific brands of pressure washer hoses can be used in both cold and hot water pressure washing. Just make sure you check the compatibility before making your final purchase. Avoid using an ordinary hose for high-temperature pressure washing. This will only damage the hose as the material cannot withstand severe temperatures. The pressure washer hose is indeed an essential part of a pressure washer machine. Thus, it is very important that you take the time to consider all the 4 factors above before buying. Remember to note all those considerations, namely: length, material, diameter, and connections. I shared my best pressure washer hose option above. It’s the best option for me, but it may not be the same for you. So, do your own assessment, check your needs, and choose the best pressure washer hose that can meet all your requirements. Once you do that, share with us your favorite pressure washer hose or the one you are currently obsessing right now. Thank you for dropping by and I hope you learned something valuable from this article. Have a great day!